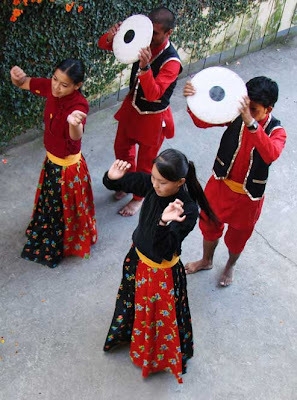 Yes, it's yet another holiday in Nepal, this one celebrating the goddess Laxmi. It's known as the Festival of Lights and is celebrated in India as Diwali. Besides the annoying sound of firecrackers, the holiday is typically associated with garlands of marigolds and strings of small lights adorning buildings and streets, much like I remember Christmas in the United States. And like at Christmas, people gather in groups to sing, though here the groups are most often teenaged boys and girls. 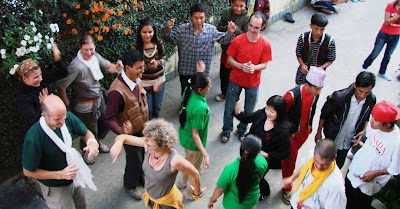 We had two of them visit our guesthouse yesterday to stage small cultural variety shows with folk and modern song and dance from Nepal, Tibet, and India. In return, the audience offers enthusiasm, applause, and their coin. Now that October is nearly over, so too are the holidays. The Nepali government is promising to start serious work on a new constitution. Stay tuned.